I can't believe that it actually snowed in Austin. 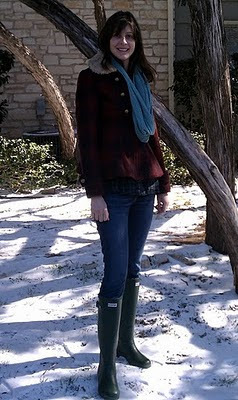 I remember it snowed once in San Antonio when I lived there as a kid, and I remember that it was a really big deal. The fact that we got more than a light dusting of snow here truly surprised me, and the fact that I actually wasn't able to drive to work this morning came as another big surprise. However, Ryno and I made the best of the snow day by staying warm inside with Elton except for our one venture out to TacoDeli to pick up lunch. Thank goodness for queso! 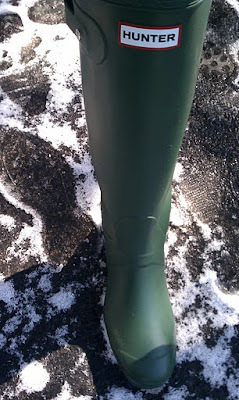 Also, I realized I never told you what Ryno got me for my birthday...Hunter boots! Today was my first day breaking them out, so I snapped a quick photo to share. They are perfect, and they keep my feet super cozy! Aren't they lovely?